Have an amazing time with family & friends with the Intex ultra frame pool set. Engineered for strength, the ultra frame pool is supported by strong, durable steel frames which are powder coated for rust resistance & beauty. Your backyard will be the place to be all summer as your family can relax & float or splash & play. Plus, Intex ultra frame pools have improved upon their history of top-of-the-line quality with new, innovative styling & a redesigned frame structure. Hydro aeration technology has been incorporated into the cartridge filter pump to provide improved water circulation, filtration, & clarity as well as increased negative ions at the water surface. Connect the Krystal clear sand filter pump & saltwater system to enjoy clear, sparkling water. Ready for water in 60 Min. New dual suction outlet fittings improve water circulation resulting in better water hygiene & clarity. The newly designed ladder also provides greater support & stability. Water capacity: (90%) 8, 403 gallon. Includes: Krystal clear sand filter pump & saltwater system 1, 600 GPH (110 - 120V). ladder. Ground cloth. Debris cover. Set-up & maintenance DVD. Get outdoors and have some fun in the sun this summer with the Phoenix pool series. 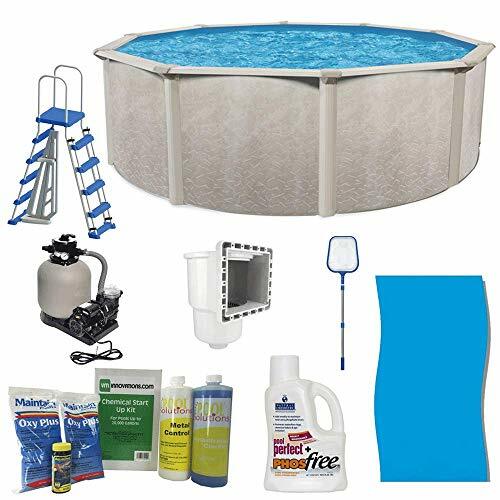 This set includes a 21 x 4.3-foot pool, a sand filter pump, a 21-foot pool liner, a skimmer, a pool ladder, chemical kit, phosphate removal chemical, and a pool net. The pool's all steel construction provides durability for years of hassle-free use and the sharp marble wall design adds an appealing feature to your yard. The steel pool frame is easy to assemble so you can be ready for fun in a matter of minutes. The sand filter has a pumping capacity of 2,400 gallons per hour and features a powerful 40 GPM pump, 4 position multiport valve, and system base. The pool liner fits most 48 and 52-inch pools. The skimmer is a standard ABS thru-wall above ground pool skimmer complete with return fitting and a vacuum plate. The A-frame ladder is perfect for pools with walls 48-52 inches tall. Don't miss out on the fun you could be having with your family and friends this summer and add the Phoenix pool kit to your backyard party. Get outdoors and have some fun in the sun this summer with the Phoenix pool series. 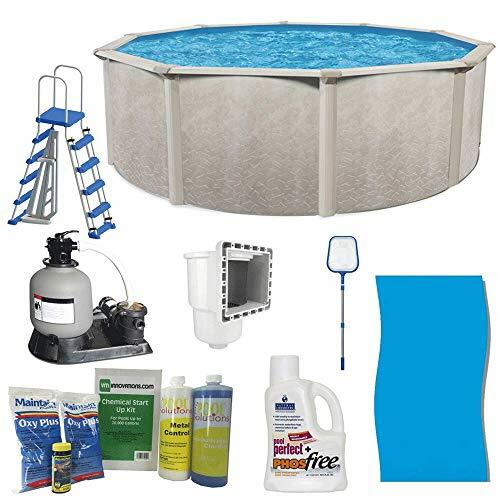 This set includes a 24 x 4.3-foot pool, a sand filter pump, a 24-foot pool liner, a skimmer, a pool ladder, chemical kit, phosphate removal chemical, and a pool net. The pool's all steel construction provides durability for years of hassle-free use and the sharp marble wall design adds an appealing feature to your yard. The steel pool frame is easy to assemble so you can be ready for fun in a matter of minutes. The sand filter has a pumping capacity of 2,400 gallons per hour and features a powerful 40 GPM pump, 4 position multiport valve, and system base. The pool liner fits most 48 and 52-inch pools. The skimmer is a standard ABS thru-wall above ground pool skimmer complete with return fitting and a vacuum plate. The A-frame ladder is perfect for pools with walls 48-52 inches tall. Don't miss out on the fun you could be having with your family and friends this summer and add the Phoenix pool kit to your backyard party. Get outdoors and have some fun in the sun this summer with the Phoenix pool series. 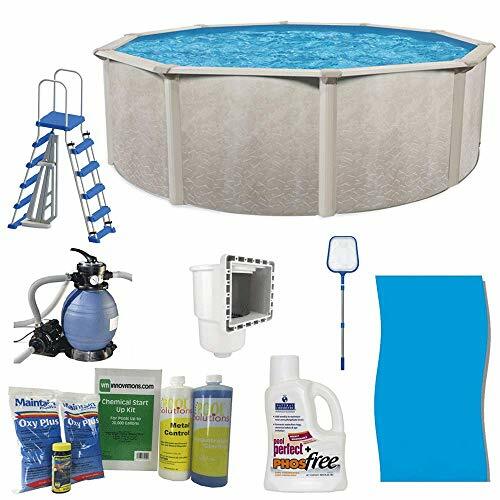 This set includes a 18 x 4.3-foot pool, a sand filter pump, an 18-foot pool liner, a skimmer, a pool ladder, chemical kit, phosphate removal chemical, and a pool net. The pool's all steel construction provides durability for years of hassle-free use and the sharp marble wall design adds an appealing feature to your yard. The steel pool frame is easy to assemble so you can be ready for fun in a matter of minutes. The sand filter has a pumping capacity of 1,200 gallons per hour and features a powerful 20 GPM pump, 4 position multiport valve, and system base. The pool liner fits most 48 and 52-inch pools. The skimmer is a standard ABS thru-wall above ground pool skimmer complete with return fitting and a vacuum plate. The A-frame ladder is perfect for pools with walls 48-52 inches tall. Don't miss out on the fun you could be having with your family and friends this summer and add the Phoenix pool kit to your backyard party. Get outdoors and have some fun in the sun this summer with the Phoenix pool series. This set includes a 15 x 4.3-foot pool, a sand filter pump, a 15-foot pool liner, a skimmer, a pool ladder, chemical kit, phosphate removal chemical, and a pool net. The pool's all steel construction provides durability for years of hassle-free use and the sharp marble wall design adds an appealing feature to your yard. The steel pool frame is easy to assemble so you can be ready for fun in a matter of minutes. The sand filter has a pumping capacity of 1,200 gallons per hour and features a powerful 20 GPM pump, 4 position multiport valve, and system base. The pool liner fits most 48 and 52-inch pools. The skimmer is a standard ABS thru-wall above ground pool skimmer complete with return fitting and a vacuum plate. The A-frame ladder is perfect for pools with walls 48-52 inches tall. Don't miss out on the fun you could be having with your family and friends this summer and add the Phoenix pool kit to your backyard party. Helps improve your pool’s safety and prevents accidental drowning. This solid 24-inch fencing helps to safely keep unwanted intruders out of the pool and keep toys and water games in. 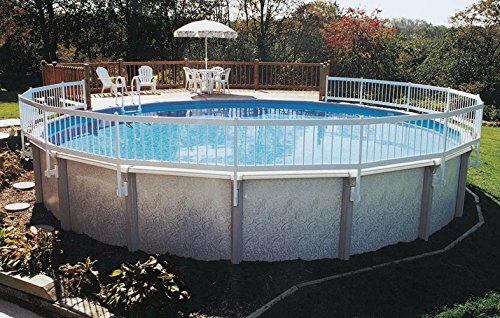 The rigid vinyl construction is maintenance-free, U.V.-protected, and can be mounted on any above-ground pool. Our mounting brackets are super-strong with rounded edges that easily attach to your pool’s uprights. Installation is easy and fencing can fit any pool. 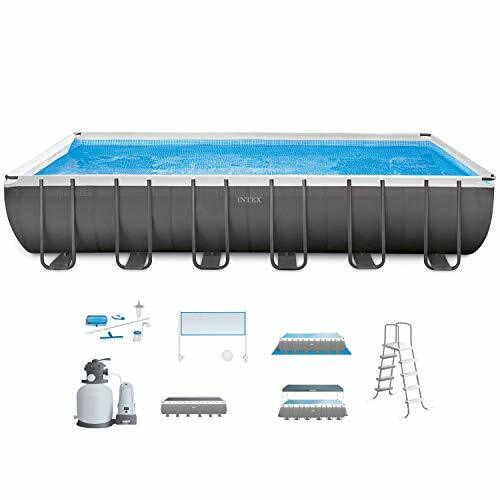 All pools require this Base Kit A, which includes 8 sections. See Add-On Kits B and C for additional fence sections as needed. All fencing, fence posts, installation instructions, and required hardware is included. Backed by a 5-Year Warranty. 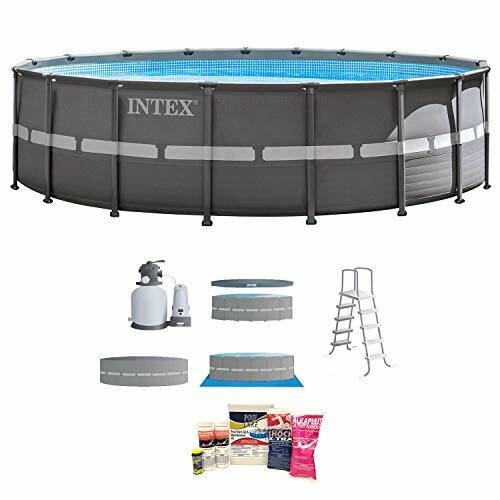 Make a splash all summer long with the Intex Easy Set, one of the most easy to assemble pools on the market. This pool will make your backyard the place to be all summer as your family can relax and play. Connect the Krystal Clear Cartridge Filter pump to enjoy clean, refreshing water. Equipped with the Ground Fault Interrupter, which is an added safety feature that shuts off the pump if electrical current is exposed to water. 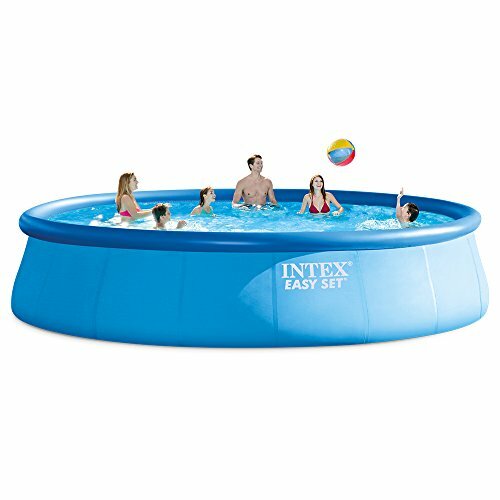 Ready for water in 30 minutes, - simply spread out on level ground, inflate the top ring, fill the pool with water, and enjoy the fun! Water capacity: (80%) 5,455 gallons. Includes: Krystal Clear Cartridge Filter pump, 1,500 gph (110-120V). Ladder. Ground Cloth. Debris Cover. Set-up and maintenance DVD. SUPER-TOUGH laminated PVC sidewalls. Convenient drain plug that connects to a garden hose so water can be drained away from pool or house area. Want more Above Ground Pool Kits similar ideas? Try to explore these searches: Over Mid Trainers, Canvas Photo Paper, and 1981 Honda Gl500 Silver Wing.